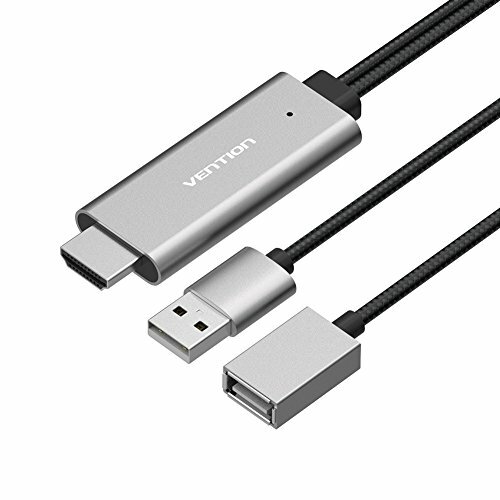 Important Reminder:The USB to HDMI cable universally applicable for iOS and Android devices.The right connection step,first, please connect the HDMI port to your TV,then connect the usb power port to charger,finally connect the lightning/type-c/micro port to your smartphone.Note:Not support MI 4C. 1080P Full HD :Support 1920*1080 Resolution ,experience full HD visual feast by connecting to TV.More convenient for office,without laptop,just connect your smartphone with the usb HDMI cable to share your documents. Compatible System and Devices:System require iOS 8 and Android 5.0 version above,compatible with iPhone 5/5c/5s/6/6 Plus/6S/7/7 Plus/8/8 Plus/X and iPad mini,also suitble for Samsung Galaxy S7/S8/S9,Huawei Mate 8/9/10,Xiaomi 6/5S etc.Note:for different of android brand system and function ,there will be different for synchronized speed and smoothing. Premium Design:With nickel plated technology, incredible durability and provide longer service life.Frosted metal shell,better heat-dissipation.Excellent wear resistance for cotton braided cable design,easy to carry and store.